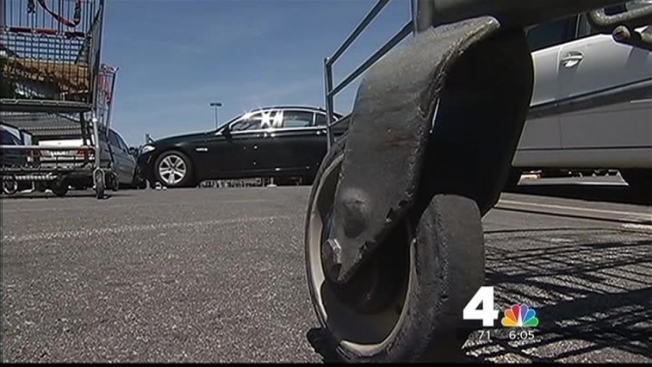 Two Loudoun County Sheriff’s deputies were injured when they tried to stop a shoplifter from fleeing the scene on Saturday afternoon. Police said a suspect was trying to take two televisions from a Costco store in Sterling, Va., when deputies confronted him. The suspect got into his car and closed the door on one deputy’s hand. A second deputy tried to grab the suspect through the window, but the suspect began driving away. "This individual drove off and dragged one of our deputies approximately 60 feet," Loudoun County Sheriff Mike Chapman said. Both deputies were taken to a local hospital, where they were treated and released. The suspect was seeing leaving the scene in a 2004 Acura with New York state license plates. "He's just a danger to everybody and we want to make sure that we apprehend him," Chapman said. A sample server was shot and killed by police at the same store last May.